Summer is moving steadily and surely towards autumn. We are right on the edge of it. The deep lush green of an unusually long, hot growing season is giving way to the blazing colors of countless sunsets. First it comes in fitful bursts: swathes of yellow, lashings of red, streaks of pink. Growing bolder and bolder. Then a deluge of orange, rust and sepia. We are poised right before that deluge. A short second before the tipping point. The quiet moment before irreversible change. I love the changing of the seasons. We don’t see as much color change as you’ve shared here. Thank you for reminding me how beautiful it is with your pictures and words. Thank you! I’m so glad I could share my love of the season with you! All these photos except for the last two are actually 2 photos placed next to each other: a fall photo (on the right) and a summer photo (on the left), I blended them to show the transition! I really wanted to communicate that feeling of being in-between. Poetic and picturesque, you made me feel the translucent edge of the summer. Thank you! As you know, this is my favorite season! I can’ t resist trying to capture it! I will be going on more hikes! There is something deeply symbolic about the change, every year seems unique, yet it also part of a greater cycle. I do so wish we had a true autumn down here. Beautiful. You should move to Europe. I loooove our falls. 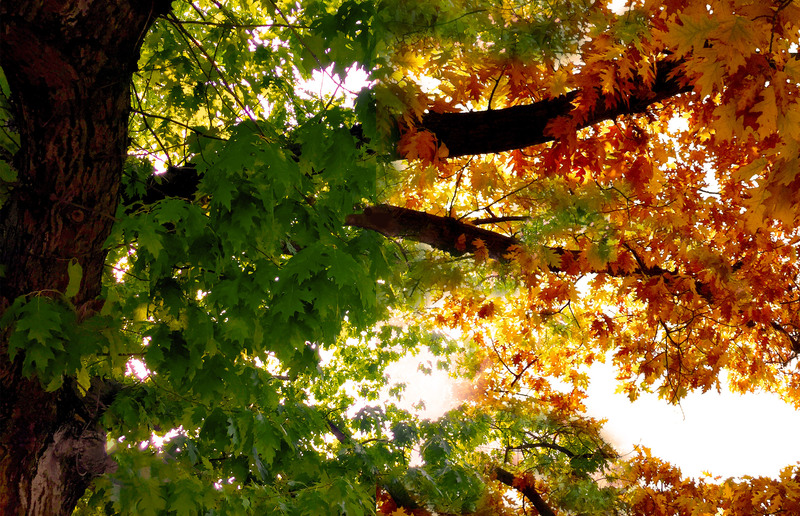 That’s my favorite season with its warm coolness and beautiful colors. I can only imagine how it must be in person there. I hope to find out for myself sometime. Thank you Wulf! I think it’s Germany‘s best kept secret that it holds a balance of all four seasons in maximum brilliance! I used to live in Seattle—there were only two seasons there (cold and rainy or mild and cloudy). I think this is actually the best season to visit Northern Europe from fall to early winter: the beautiful broadleaf parks and forests in their autumn glory, then the first snow and the wonderful Christmas markets and celebrations. So I agree with Bojana, you should come! It is at the top of my list. One of the wonderful things about Redding (and there are many, many things not so much so) is that we do have four seasons, with an asterisk. Spring and Fall are like you would expect from a true Spring and Fall, winter is cold and wet but not too white. Summer is blazing hot like the infernal pits themselves. Still, I love it. I grew up in coastal fog and 365 days of roughly 68 degrees, and I hated that. Thought you would like that! We are a bit odd down here. 😂👍 That is making me so hungry!! I wish we had crawfish season! And softshell crab and lobster and chocolate truffle seasons come to think of it! Thank you Bojana! It’s my favorite season too! All these photos except for the last two are actually 2 photos placed next to each other: a fall photo (on the right) and a summer photo (on the left), I blended them to show the transition!